diagonally, vertically or horizontally in a row will win. Player 1 will begin first by dragging the blue cards to the respective cell. 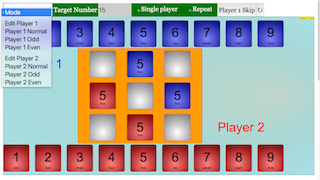 Note that if Player 2 attempts to place their 6 during Player 1's Turn, a pop up will occur. This will automatically send the card back to their initial spot. And now it's Player 2 to move on after Player 1. Note that if Player 1 tries to add a card during Player 2's Turn, the same pop up will occur. and a loop will occur. either Horizontally, Vertically or Diagonally. Double clicking anywhere in the panel to toggle full screen.